I met Mike Gerber ten years ago. He came to my house to interview me about Jews and Jazz. He sat with me for many hours, desperately trying to squeeze out of me an insight into the inherent bond between Jazz and Jews. I could hardly help him. I am not a musicologist. Furthermore, I cannot hear any particular Jewish musical influence in Jazz. Though it is true that more than a few Jazz master artists and iconic composers were Jewish by ethnicity ( and this fact in itself deserves a study ), but jazz, as an art form, is far from being Judeo-centric or Jewish. The greatness of jazz music is grounded on its capacity to bring together people of all colours and ethnicities. Jazz made itself into a cosmopolitan language and a symbol of freedom because of its diversity of sounds, rhythms and cultures. And with all due respect to Michael Gerber and his obsession with Jewish cultural importance, I cannot hear the Jew in Gershwin or in Michael Brecker. I could instead hear Africa, Cuba, Blues, Baroque, NYC, Paris. In fact I can hear everything but the Jewish Ghetto. When we met, I suggested to Gerber that for many Jewish artists, Jazz is actually an escape route from the ghetto, from the chicken soup, gefilte fish, Zionism and other symbols of chosen-ness. At the time, I also discussed this issue with drummer star Asaf Sirkis, song writer Chaz Jankel and legendary New York saxophonist Bob Berg and they obviously agreed with me. I myself can testify that twelve bars into my new path as a young Jazz enthusiast, I managed to forget Zionism, Israel and the IDF. I didn’t want to die on the Zionist altar : instead I dreamed to swing in Paris, or bop in NYC. For many of us, Israelis and Jewish musicians, Jazz was a window of opportunity. It was a true means towards liberation. Gerber didn’t like my idea that much. It could easily dismantle his Jewish project. Gerber spent seven years writing a gigantic text about Jews and Jazz, which is, in my opinion, one of the most disturbing books in the history of Jazz literature. 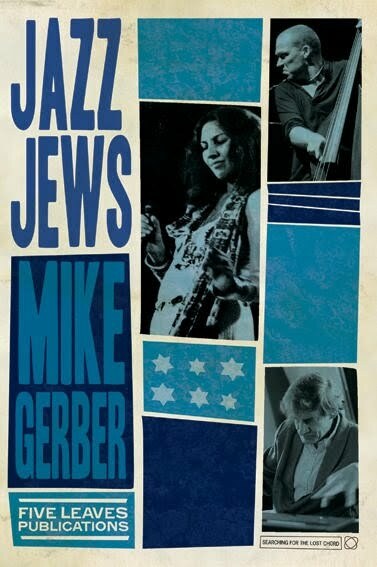 As Gerber’s website suggests, the book “explores the role of Jews in breaking the colour bar in American jazz, and in using jazz as an instrument against apartheid and against Soviet repression”. But here is a clear problem: though it is indeed very important for Gerber to present Jewish jazz as a ‘progressive affair’ at the heart of the anti Apartheid movement -- it is far from being clear why Jewish Jazz musicians are far from being actively involved in the anti Zionist movement. If Jewish Jazz musicians are somehow wonderfully progressive -- how is it that we hardly see any Jewish Jazz collective movement denouncing Zionism or Israel? Gerber is obviously totally foreign to Jazz and its spirit. He clearly fails to realize that playing music is the ultimate form of being amongst others. When you play music, issues to do with race, identity, politics and cultural barriers are put aside. Being there and producing beauty with others is in itself the strongest possible statement. Jazz musicians do not have to say much, for the music carries the strongest message. In our Jazza festival last week we had at least four Jewish artists. They operated as ordinary human beings. They didn’t carry any flags or banners. They didn’t ask for any special treatment. Michael Gerber, however, didn’t come to our Jazza concert (though he somehow always calls me in advance to ask for a ‘free press pass’ for Ronnie Scott’s when I play there). Jewish Socialist Groups did not support Jazza either, nor did any other Jewish organization. But, let me tell you, many Jews did. They joined us as ordinary human beings. Unlike Mike Gerber and his Jewish Socialists they obviously assimilated into humanity. Three weeks ago Gerber asked me to send him some music for his 'Jews only' radio show. I obviously refused. I suggested to him that when he decides to feature and promote Gentiles’ music, he should contact me again and I will consider. This morning after reading Gerber’s press release, I wrote back to him in sarcasm -- I suggested that my (imaginary) German Friend “Klaus Hofmann wants to host an Aryan Jazz programme.” I thought that it would be nice to have the two racist Radio programmes next to each other. Gerber’s answer took me by surprise. Though Gerber is a member of the Jewish Socialist Group, and in spite of the fact that Jewish Socialists claim also to be anti Zionists who support cultural boycott of Israel, Gerber, all of a sudden, decided to endorse the Jewish state as a Jewish cultural Mecca. He even became an active mouthpiece for Israeli art (instead of boycotting it). When pushed into a corner the Jewish Socialist somehow changed his spots. He even managed to endorse Zionist culture. I can accept that Israel is indeed a well of very many incredible Jazz talents. However, one question is still left open -- is there such a thing as Jewish Jazz? Gerber is either misleading, or may even be misled by himself. There is a big difference between Latin Jazz and Jewish Jazz : Latin Jazz is a clear musical genre that is intrinsically associated with a piece of geography. Musicians around the world can easily define Latin Jazz in musical terms. Anyone can join a Latin Jazz combo once achieving a reasonable command of the Latin musical language. Jewish Jazz, on the contrary, is not an art form, and it is not a musical genre. There is no such thing, outside of Gerber’s universe. I guess that in order to make it into Gerber’s book, all you need is a Jewish mother. This is also exactly what you need in order to make Aliya to Israel and dwell on Palestinian land. As much as I am happy with Israel exposing its true nature, I am very happy with Mike Gerber pushing his agenda. It was Mike who already ten years ago opened my eyes to this bizarre Jewish collective hubris. It was Mike Gerber who inspired me afew years ago to invent the satirical character Artie Fishel, the American musician who is totally convinced that Jazz is neither American or African, but entirely Jewish. Like Gerber, Fishel wants to bring Jazz to where it belongs, namely The Promised Band.